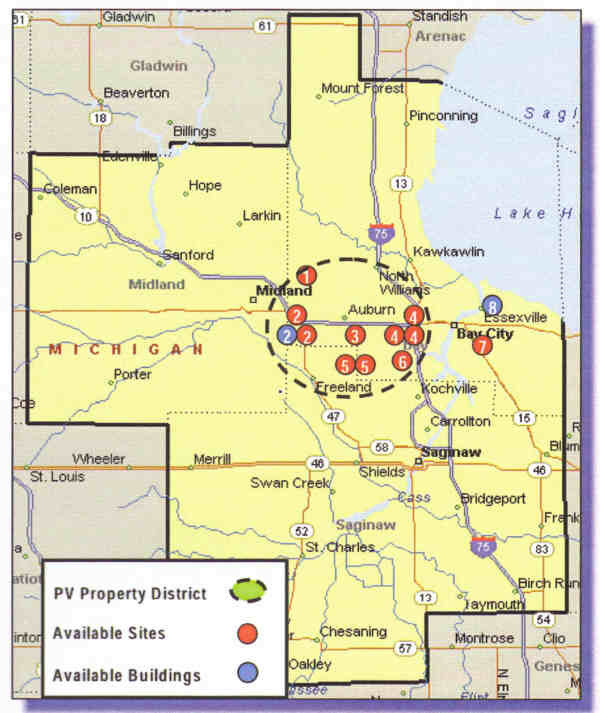 Solar industry initiatives in the Great Lakes Bay Region have identified 45 sites and 9 buildings with six potential site opportunities shown on this map. Solar energy has been selected as the business investment focus of the future for the Saginaw Bay tri-county region, now called the Great Lakes Bay area. "Locate at the source" is the byword adopted by the region for its international initiative for rapid commercialization of the photovoltaic (PV) sector. The source is mainly Dow Corning Corp., world leader in production of polycrystalline silicon that is a main component in solar panels as well as electronic devices. The target is 10-15 large manufacturing enterprises that are expected to be conducting site searches over the next few years seeking mega-millions in investments and 500-3,000 jobs per location. Bay County Executive Tom Hickner, left, chats with Tom Paige, Williams Township supervisor and new board member of the Michigan Townships Association. Dow Corning's world headquarters is in Williams Township. Scott Walker, right, executive director of Midland Tomorrow, is interviewed by the television media following his presentation on solar energy development projects locally. At the high end, such developments would create up to 45,000 jobs. One marketing theme will be: "Mid-Michigan - The Perfect PV Location." The area has expertise in chemical handling, process engineering, production automation and innovation, experts said. The photovoltaic (PV) industry is expected to grow 10 to 20 percent annually over the next 20 years, officials said, adding: "By 2015, PV energy should be cost competitive with other forms of energy nationwide." The industry is looking for "geographically logical clusters," speakers at the meeting said. One of the solar meeting presenters, Mary Lou Benecke, Dow Corning state government relations director, is interviewed by Bill Hewitt of WSGW Radio. In addition, since this area has more sun than Germany, world leader in solar energy production, we can cut our energy use with solar, said Mary Lou Benecke, state government relations manager for Dow Corning Corp.
She had noted recently that this mid-Michigan area has sunlight equivalent to that reaching Spain, dismissing the long-standing myth that there is not enough sun here to support solar energy production. "Bay Future, Inc., Midland Tomorrow and Saginaw Future Inc. have launched a dynamic partnership to attract new business investment to the region," said Fred Hollister, President and CEO of Bay Future, Inc.
Ms. Benecke spoke on current solar development projects in the region which could lead to additional investment. She also touched on solar advancement and the alternative energy opportunities in the emerging American alternative energy market. The Great Lakes Bay Economic Development Partnership (EDP) is a marketing collaboration that will present a unified marketing message and help stimulate the region's solar industry, said Scott Walker, executive director of Midland Tomorrow. Mark Clevey, Saginaw Valley State University (SVSU), left, Mike Hus, Dow Chemical Solar Solutions R&D leader, who spoke at the meeting, and Fred Hollister, president of Bay Future Inc., at the solar development regional partnership meeting at SVSU. Linda Sims, Consumers Energy executive director of Community Services, discusses state and regional energy needs and projects with Chris Shannon, official of Michigan Works and president of the Bay City Commission. Merrill Technologies Group, Saginaw based firm offering precision machining, fabrication, testing and engineering for the solar, aviation, automotive and advanced manufacturing industries. A specialized marketing campaign and Web site that targets the solar supply chain was officially launched (www.MISolarAdvantage.com). The Great Lakes Bay EDP is also developing a complete package of marketing materials to highlight the region's business attributes and quality of life. The campaign will stress the region's diverse workforce, including one of the highest per-capita concentration of PhD professionals in the U.S., almost 20 percent of the region's workforce with significant post-secondary education, and nearly 20 percent of the workforce employed in manufacturing, many with experience in electronics and precision automotive components transferring directly to solar industry manufacturing. "The three economic development organizations have worked cooperatively on initiatives in the past, but this is the first time an official partnership has been set in place," said Mr. Hollister. "The Great Lakes Bay EDP will allow us combine resources to better market the region." A Solar and Photovoltaic Study conducted by The Austin Group and Chabin Concepts has been conducted. The specialized solar consultants contracted by the economic development organizations presented results of the study to about 150 attendees at the meeting. Research was conducted on existing solar-related companies in Bay, Midland and Saginaw Counties and how to leverage that presence in order to attract new investment. The study also detailed the necessary support structure for a strong solar business climate and how the region matched up to that need. "The study confirmed a number of regional strengths, such as our strong solar and chemical companies, skilled workforce and educational institutions," said Scott Walker, president of Midland Tomorrow. "The consultants also developed a plan of action to advance the regional business climate to be more attractive to the solar industry." "This is an exciting time for the entire region as we have an opportunity to help develop and grow a new economy," said JoAnn T. Crary, president of Saginaw Future Inc. "We will be reaching out to solar companies around the world touting this area as a global center for the photovoltaic industry." "The BUZZ" - Read Feedback From Readers! Awesome coverage, excellent article and wrap up of what could prove to be something that greatly impacts us here in Mid-Michigan. Noting our numerous regional strengths and the power they have in moving forward, I will keep my fingers crossed that this initiative is supported and implemented!